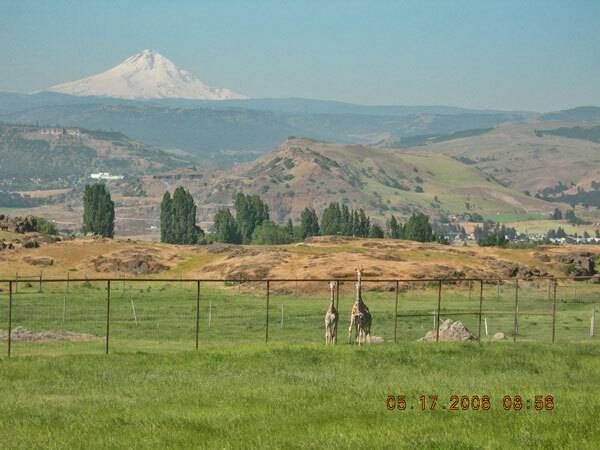 Schreiner Farms located in Dallesport, Washington State! 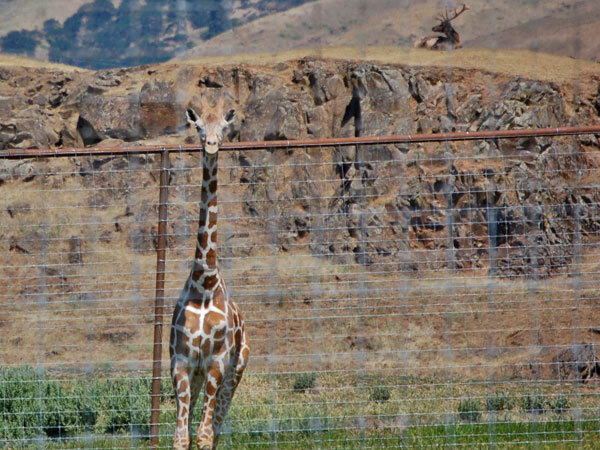 The Giraffe is the tallest of all land animals. The males can reach 16 to 18 feet (4.8 to 5.5 meters) tall and weigh up to 4000 pounds (1815 kilograms). Females are generally slightly shorter and weigh less. 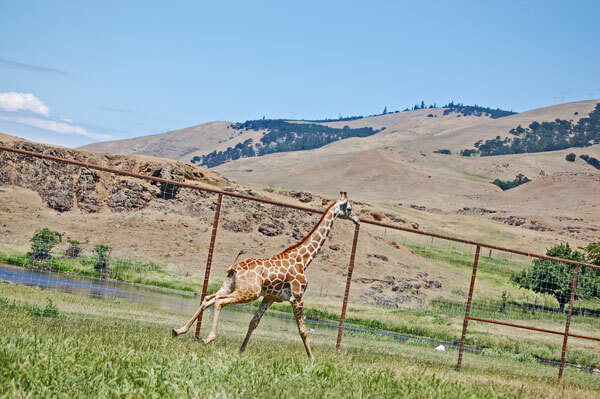 Giraffes use their long tongues to extend their reach. 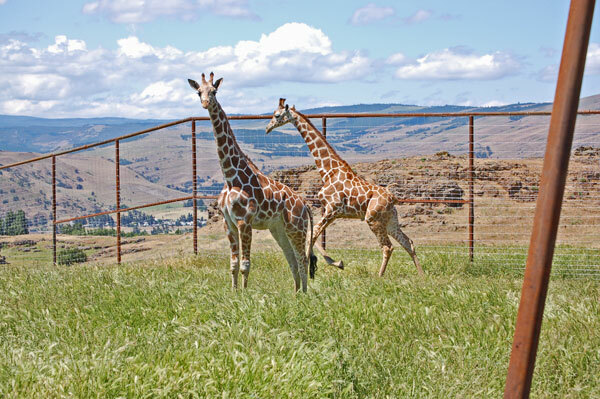 They have spots covering their bodies, except the underbellies, with each giraffe having a unique pattern of spots. 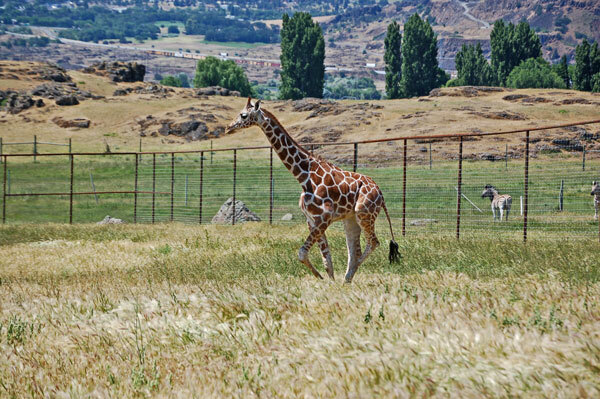 Giraffes have long necks, which they use to browse the leaves of trees. They also have slightly elongated forelegs, about 10% longer than their hind legs. 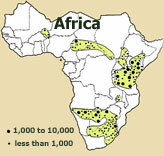 Like nearly all mammals, a giraffe has seven neck vertebrae, which are extremely elongated. These bones produce bud-like horns on top of the head. 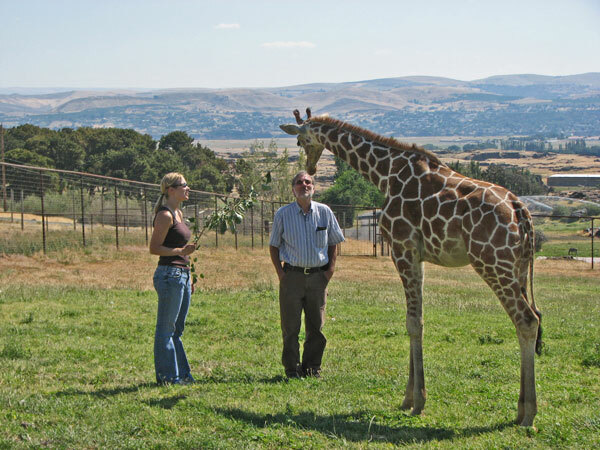 Modifications to the giraffe's structure have evolved, particularly to the circulatory system. 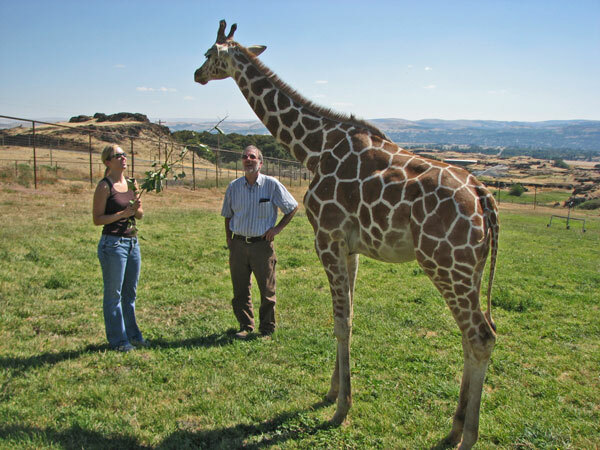 A giraffe's heart, which can weigh up to 24 lb (10 kg), has to generate double the normal blood pressure for a large mammal in order to maintain blood flow against gravity, for the brain. 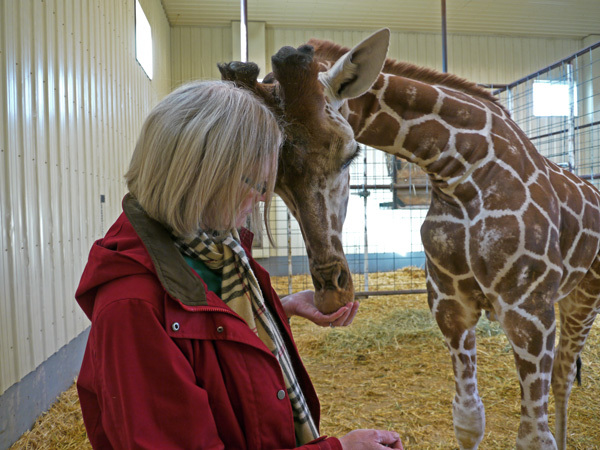 In the upper neck, a complex pressure-regulation system prevents excess blood flow to the brain when the giraffe lowers its head to drink. On the other hand, the blood vessels in the lower legs are under great pressure because of the weight of fluid pressing down on them. 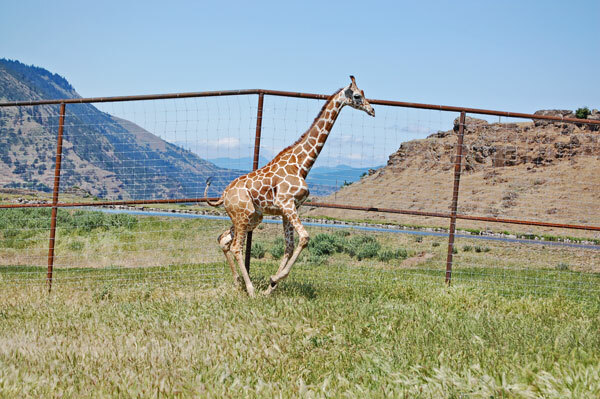 In other animals, such pressure would force the blood out through the capillary walls; giraffes, however, have a very tight sheath of thick skin over their lower limbs that maintain extra high vascular pressure. 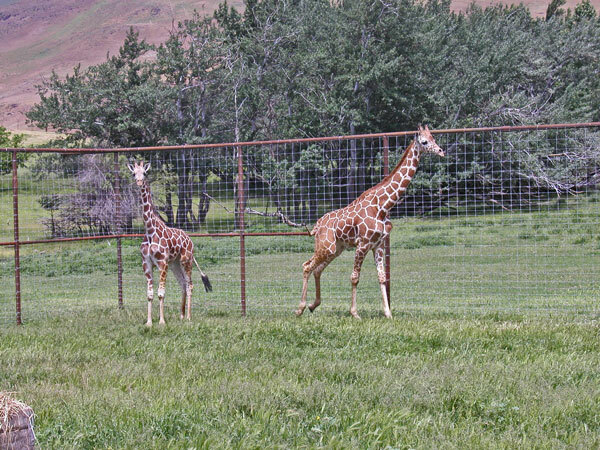 A pregnant giraffe will give birth to a single calf between 14 and 15 months after conception. She gives birth standing up and the embryonic sack bursts when the baby falls to the ground. 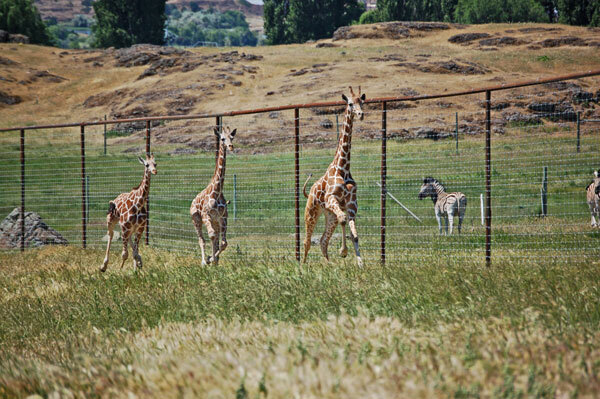 Newborn giraffes are about 6 feet (1.8 meters) tall. Within a few hours of being born, calves can run however, for the first two weeks, they spend most of their time lying down, guarded by their mothers. The spotted pattern on a newborn giraffe provides a certain degree of camouflage. The life expectancy is between 20 and 25 years in the wild and 28 years in captivity. 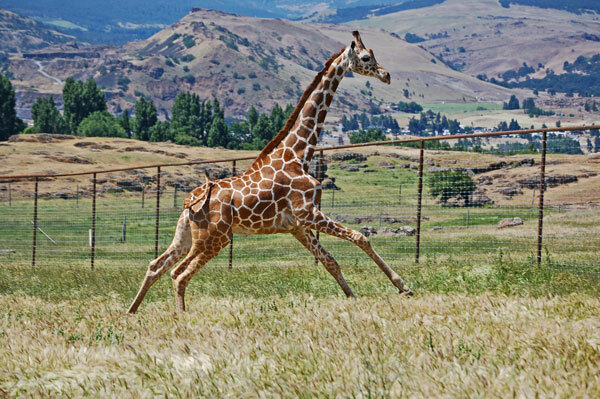 The pace of the giraffe is an amble, although when pursued it can run up to 35 mph (56 km/h). The small size of its lungs prevents it from sustaining a lengthened run. 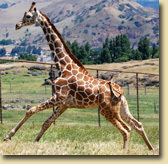 The giraffe defends itself against threats by kicking with great force. 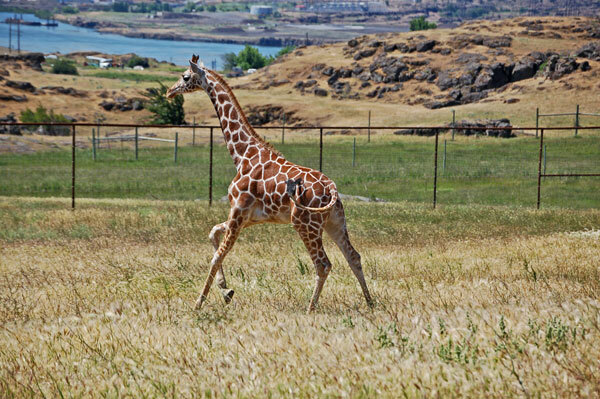 A single well-placed kick of an adult giraffe can shatter a lion's skull or break its spine. 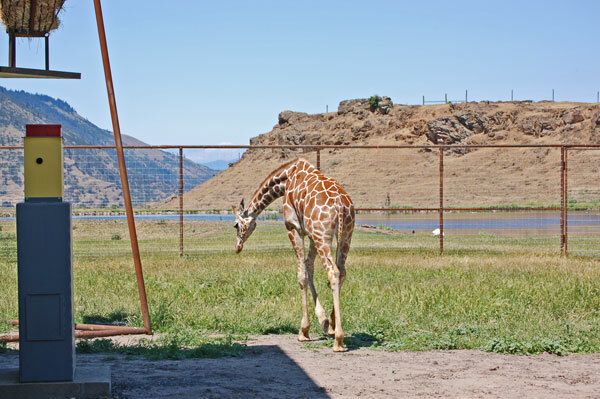 The giraffe has one of the shortest sleep requirements of any mammal, which is between 20 minutes and two hours in a 24-hour period. 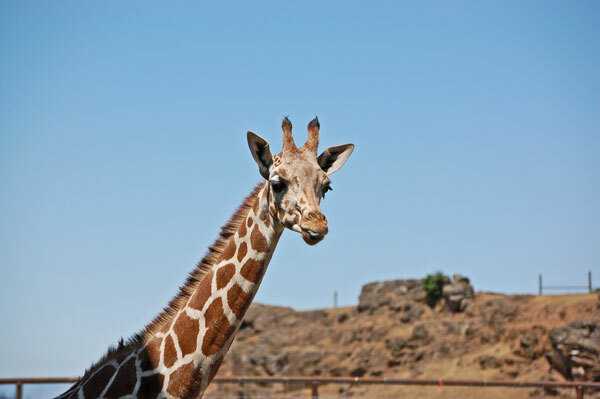 A giraffe will clean off any bugs that appear on its face with its extremely long tongue of 18 inches (46 cm). 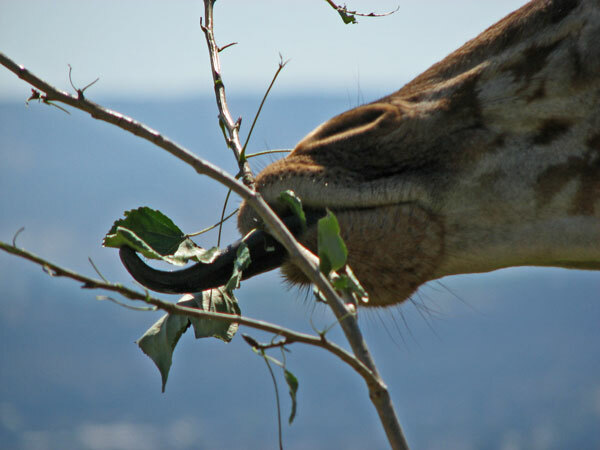 The tongue is tough because of the giraffe's diet, which includes thorns from the tree it makes a meal of. 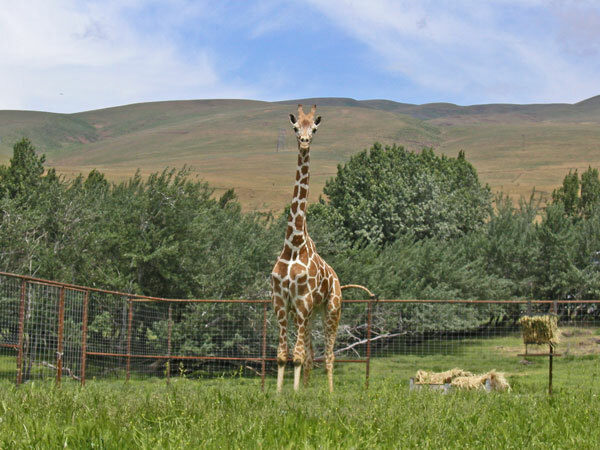 In Southern Africa, giraffes are partial to all acacia trees and possess a specially adapted tongue and lips that appear to be immune to the vicious thorns. 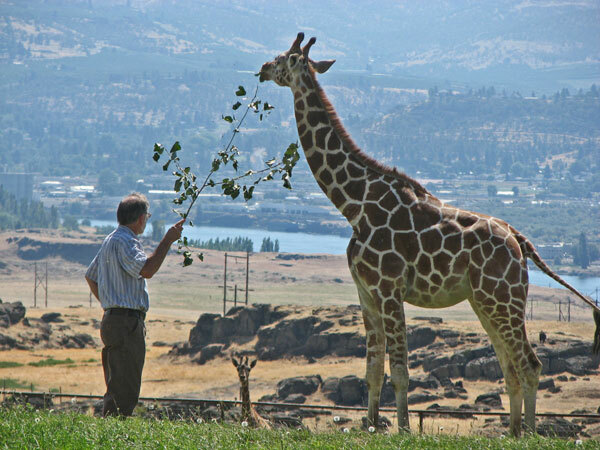 Giraffe can eat 140 lb (63 kg) of leaves and twigs daily. 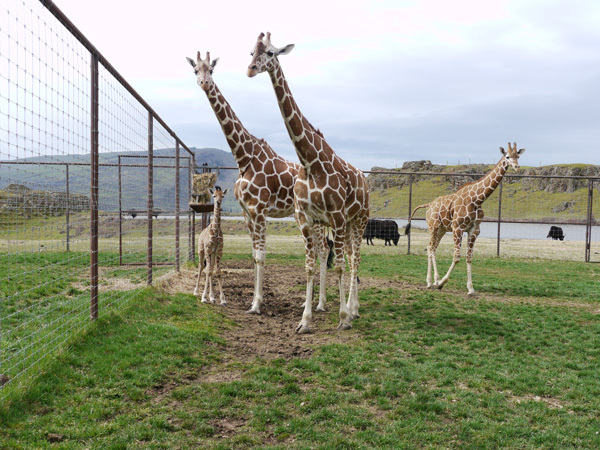 Males use their long necks not only for feeding, but also for combat and competition. A female's neck and head mass will level off after about ten years of age, while a male's will continue to increase throughout its twenty-plus years of life. The males engage in necking combat. These battles can be fatal, but are more often less severe. 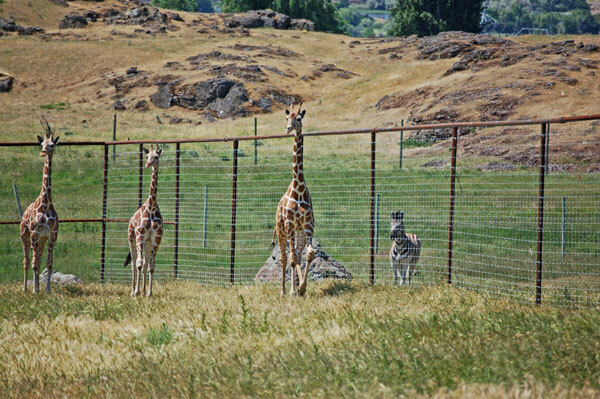 Giraffes are thought to be mute. However, recent research has shown evidence that the animal communicates at frequencies below 20 Hz, which cannot be heard by humans but can be felt as vibrations. 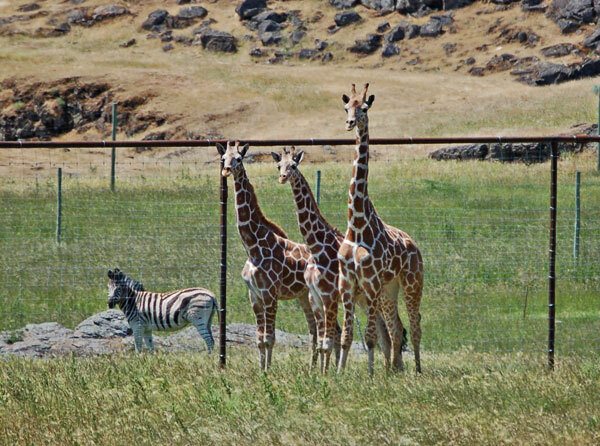 The instinct of some other African animals is to stay close to the giraffe, for the giraffe's high vantage point can see predators from far away. 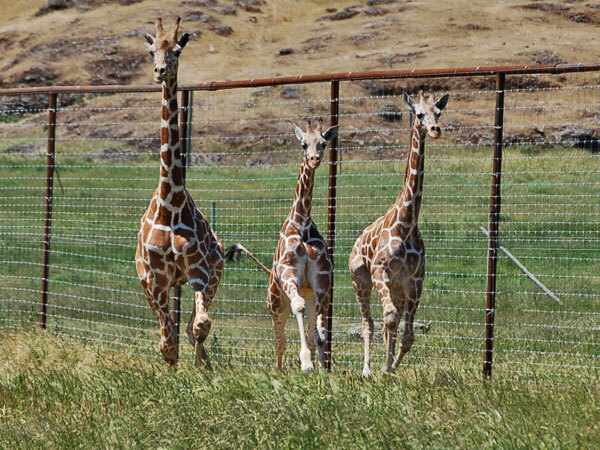 We have the subspecies known as Reticulated Giraffe and it is native to Somalia with a range from Somalia to northeastern Kenya and Ethiopia. 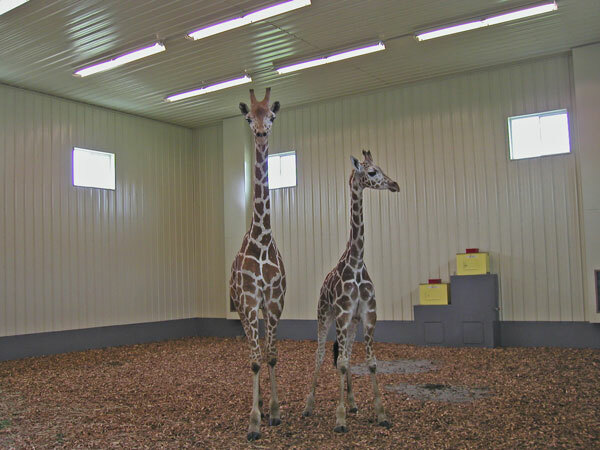 On the 11th of April 2011 our youngest female giraffe had a baby giraffe. For photos and more information click HERE. If all photo do not load, click on your "Refresh" or "Reload" button on your browser. If the photo did not load there will be a "Red X" or a small Icon in the upper left corner of the box.